This is a great little seat that has a lovely and elegant arch above it. 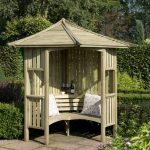 Perfect for anyone who wants to add a sense of romantic style to their garden, it has plenty of practical features that raise it above other arbours of a similar style. You get some choices here. If you have trailing plants, now is the time to bring them out and run them up the sides of the arbour. It would make for a great centerpiece to the garden, or an end to a path. It’s certainly a romantic little piece, and you and your loved one can easily sit on it and enjoy a long summer’s afternoon. 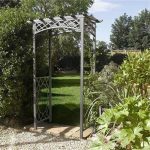 The open lattices on the side are intricate and very stylish, and we cannot fault the gently sloping arch. You’ve also got an arbour here that has been pressure treated. This means you have a piece that has been treated at the factory, and is therefore in no need of further treatment. Usually, you would have to treat the arbour every year, but that is not the case with this item. It’s tough, and permanently rot-proof. Is there a guarantee? There is a very generous guarantee. 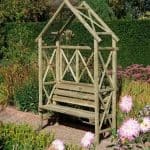 Because the arbour benefits from that pressure treatment, you have a guarantee for 10 years that covers rot. There are some specific instructions for care, but you’re looking at a pressure treated unit, so there aren’t really any concerns about rot anyway. What’s the apex design do for the roof? The apex design helps a lot with even more protection against rot. It stops rainwater from being a problem, by sending it away quickly and effectively from the roof arch. 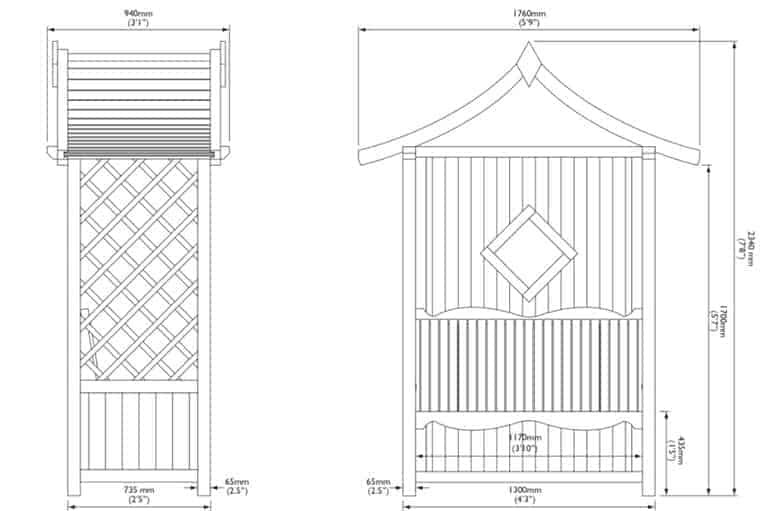 It’s a little touch that makes the arbour even more hardy against rainwater, which is a good thing. Can I build it myself? We wouldn’t recommend it. While it is indeed a very simple construction, the timber is heavier than you expect. 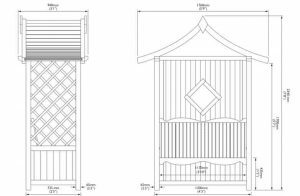 We recommend that you and one other person work to create the arbour. 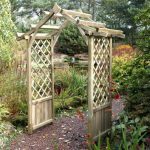 Blooma Elegant Wooden Arbour 2.34 x 1.76 x 0.94: So what’s the quality like? It’s all about that pressure treatment. 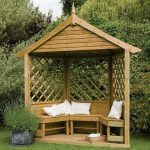 This goes a long way to making the arbour virtually indestructible. And with heavy timber being part of the unit anyway, this is a very durable and high quality construction. 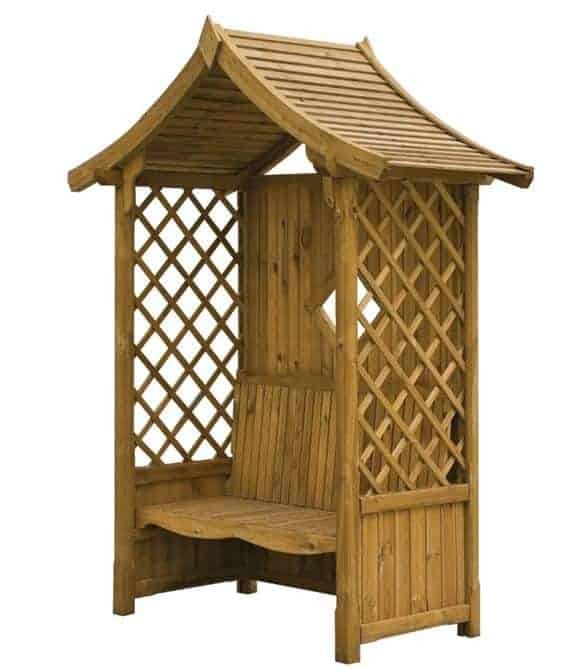 It’s a simple, romantic arbour. There is plenty of stability there in the construction and the pre-treatment, and we think that’s a great aspect. Just remember that it is heavier than it looks, so take care during construction. I live in an apartment in the city and recently moved there from the suburbs where I grew up. I really miss having a garden and spending time outdoors so I’ve decided to convert my terrace into a little herb garden. I got a whole lot of plants in there and even got some artificial grass to make it seem authentic, but for the large part, it still looked like a terrace with pots in it, and not a garden. 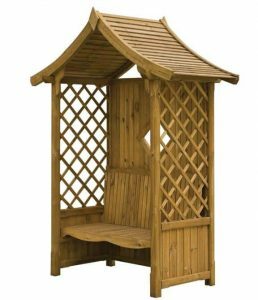 My old garden in the suburbs had a gorgeous huge arbour and I couldn’t have a large one like that in the small space I’ve got, but I could sure get a mini-version. 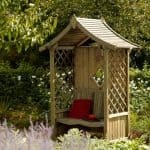 So I started looking online for a small but well-made arbour, and eventually came across this one. It caught my fancy immediately, and I can tell you that I’ve never been happier with a purchase. I rarely miss my old garden now that I’ve got my little apartment one. I come home from work, kick off my heels, and take a glass of wine to my arbour and watch the sunset almost daily. It’s a gorgeous little accessory, and the best part, it didn’t burn a hole in my pocket. The size is perfect, as is the woodwork, and finishing. I would recommend this to anyone looking to transform a small space like I did.